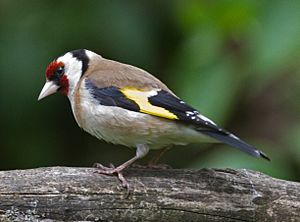 Goldfinch are finches of the genus Carduelis. They are small passerine birds of the family Fringillidae. 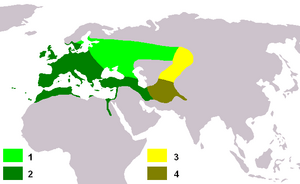 The goldfinch breeds across Europe, North Africa, and western and central Asia, in open, partially wooded lowlands. It is resident in the milder west of its range, but migrates from colder regions. It will also make local movements, even in the west, to escape bad weather. It has been introduced to many areas of the world. 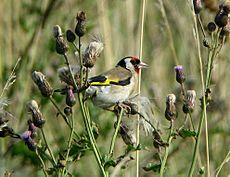 The goldfinch's preferred food is small seeds such as those from thistles and teasels, but insects are also taken when feeding young. It also regularly visits bird feeders in winter. They nest in the outer twigs of tall leafy trees, or even in bamboo, laying four to six eggs which hatch in 11–14 days. 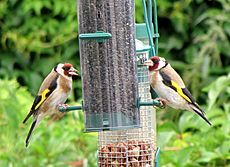 In the winter goldfinches group together to form flocks of up to forty birds, occasionally more. The song is a pleasant silvery twittering. Goldfinch Facts for Kids. Kiddle Encyclopedia.